For the health and beauty of your feet, it’s important to take regular care to keep them in tip top shape. From daily application of moisturizer, to weekly checks, and also maintaining a healthy regime of keeping on your toes; foot care begins with the trimming of nails, and ends in the buffing and exfoliation of skin. Keep your feet beautiful, and your skin feeling supple, with a clever foot care routine that can help you’ll love your feet to even take that selfie on the beach. Starting with the basics, if there’s one thing you should be certain to do every day, it’s washing your feet with care. In the shower, apply a pH-friendly soap or shower gel to all areas of your feet, including between the toes and the heel. This will reduce bacteria, sweat and help clear away dead skin too. You could also exfoliate your skin, keeping it smooth and removing more dead skin from your feet. Before you go to bed, moisturize your feet. This will give you supple and smooth and beautiful feet in the morning, with no fuss. The Amopé Pedi Perfect™ Extra Rich Skin Recovery Foot Cream enables you to keep up your essential foot care routine overnight, to wake up to beautiful feet in the morning. If you’d rather do your moisturizing in the morning, then Amope also produces a day cream, to keep you moisturized all day. You should trim the nails on your feet regularly, this, along with filing them, will keep them short enough to feel comfortable, and will help prevent build-up of sweat and fungus under the nail. You might want to spend your Sunday night with a foot care regime, including trimming, filing and also smoothing. 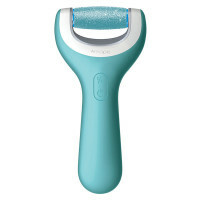 Use the Amopé Pedi Perfect™ Electronic Foot File with Diamond Crystals, with an assortment of three different roller heads (Regular Coarse: for normal hard skin, Extra Coarse: for very tough hard skin and Soft Touch: for the perfect and smooth finish) which can take care of hard skin with little effort. Regular foot care equals healthy and beautiful feet, and less likelihood of infection. It also means beautiful feet that you just won’t be able to avoid showing off. Work out your routine, by starting with the Amopé Pedi Perfect™ line of products.